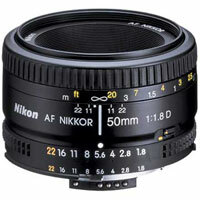 Is it just plain crazy that I want to buy a 50mm Nikon lens for under $30 on ebay? I can’t find any under $60. I don’t even need auto-focus. I want a pancake lens for my Nikon FE (film manual focus camera) so it’ll be easier to carry around when I want to take the occasional film photo when I’m at the zoo with the kids. I’ll take a D, AF, or even an AI or AI-S. I’m a little nervous about taking an E. Anything pre-AI need not apply. Boy this is really frustrating. There’s so many AI lenses out there, but they’re all expensive. I bought my Petri 7 s last year for $16 including shipping and it has a great f/1.8 50mm lens. I just like the focusing controls better on the Nikon FE.